This is actually the name of a Geyser in the South of Iceland, and not surprisingly, it is where the English word “Geyser” came from. 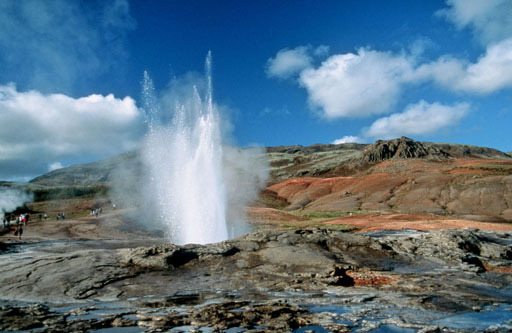 It is assumed that the name “Geysir” came from the Old Norse verb “geysa,” or “to gush.” This Geysir is one of the first to be discovered, and as of today it is almost completely inactive. When it does erupt, it can reach heights of up to 70 feet, but your chances of witnessing it are extremely limited. That is, unless you’re in Iceland when an earthquake hits. This entry was posted in Uncategorized and tagged Geysir, Old Norse, Word of the Day. Bookmark the permalink.